We have found ourselves with lots of single dye lot balls of De Rerum Natura’s Ulysse, having just one, two or three balls of each dye lot left. So we thought it would be fun to set ourselves the challenge of rounding up some patterns that use just one ball of Ulysse and we were not disappointed with the results! We’ve also put all those last remaining dye lot balls together into a big dye lot sale which you can shop here. Enjoy! Using just one ball of each colour, we love the ombre effect on this shawl. A stunning geometric colour work beanie with the potential for some incredible colour options. We love these minimal mitts with their subtle tree motif. There are so many dreamy potential colour combinations for this beanie. We also love the use of corrugated rib and bold colour work. The sweetest pixie bonnet with a dainty cable pattern running down the sides. Inspired by the first snowfall in a forest covered, this cowl would be warm and cosy and quick to make. Sweet stripes and slipped stitch detailing on the sides. Ulysse has the perfect colours for this little hat. Finally, how beautiful are these stranded colour work mittens inspired by the colourwork traditions from Norway, Estonia and Latvia. 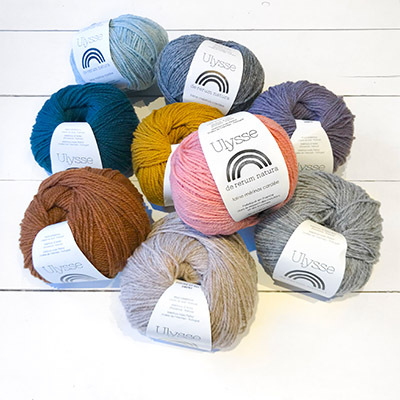 You can shop the last remaining dye lot balls of Ulysse in our dye lot sale at 30% off here.